Reading the second book in a series first is like getting to have dessert first. 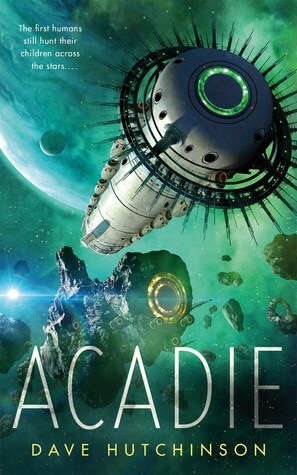 More than likely the worldbuilding is already done, the characters know what they are about, the author has a clearer idea of where the story is going and what should happen. You might feel a little lost, and your mileage will certainly vary. But then when you do go back and read the first book, you’ll feel like a psychic, because you’ll know all sorts of details the characters don’t know! Suffice to say, the first thing I did after I finished Nicole Kornher-Stace’s Latchkey was order the first book in the series, Archivist Wasp. 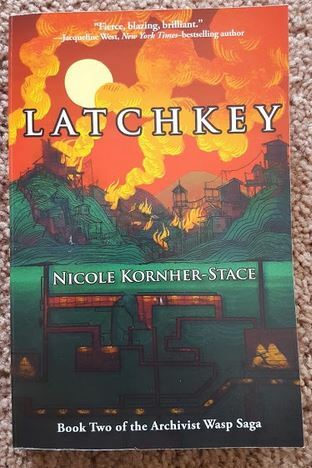 Latchkey is part post-apocalyptic, part mythology, part ghost story, and and all perspective shift, told through the lens of Kornher-Stace’s mastery of prose and evocatively transportive language. This is the kind of sharp vibrant prose that would translate beautifully to an anime or a movie. Highly recommended for fans of Robert Jackson Bennett’s Divine Cities series, fans of N.K. Jemisin’s Broken Earth series, and anyone who enjoys a gorgeously told story about horrible things that should never have happened. With metaphors that shouldn’t make sense but do, a poetry on the weight of stories that became legend that became religion, and a world where a hypervigilant 6th sense itch is the only thing that will save your life, nothing in Latchkey stays merely on the page. When Isabel was afraid, I was afraid. When she couldn’t breathe, I felt like I couldn’t breathe. When she is about to drop dead of exhaustion, I felt tired and fatigued. She never lost hope, so I didn’t either. When I say this was an exhausting read, I mean that as the highest form of praise. Latchkey takes place a few years after the events of Korner-Stace’s 2015 award winning Archivist Wasp. Isabel and the other ex-upstarts are still getting used to the fact that they won’t have to kill their friends to survive, that they won’t ever again have to live a life of violence and fear. The old tradition of the archivists has come to an end, even if the PTSD is still at the surface. Isabel and the other girls need to figure out what to do with the rest of their lives. In the meantime, they’ll still care for the Catchkeep Shrine, still say the words of their goddess, still have hope that the townspeople of Sweetwater can come to trust them.